As promised during last week’s Worldwide Developers Conference, Apple on Wednesday released the iPhone 3.0 software update, a major overhaul of its mobile operating system that promises more than 100 new features and enhancements. The size of the 3.0 update ranges from 230MB to 260MB, depending on which device you’re upgrading. The update is available through iTunes. To install the iPhone 3.0 update, users will also need to be running iTunes 8.2. Apple released that update to its music jukebox software and online store interface earlier this month to support many of the new features introduced with iPhone 3.0. The iPhone 3.0 update is free to all iPhone users. iPod touch users will need to pay $10 to upgrade to version 3.0 of the software. First announced at a special press event in March, the iPhone 3.0 update promises 100 features and enhancements for users. Highlights to this update include the long-awaited arrival of cut, copy, and paste functionality, a horizontal keyboard for more applications than just the mobile Safari browser, and a Find My Phone feature that helps subscribers to Apple’s MobileMe service locate lost phones. “Apple has really refined the experience they first delivered two years ago to the point where everything is head and shoulders above anything else out there,” said Michael Gartenberg, vice president of strategy and analysis at market-research firm Interpret. With Apple setting the bar for smartphones with its iPhone offerings, Gartenberg said, Wednesday’s iPhone 3.0 release—coupled with the scheduled Friday release for the new iPhone 3G S—gives Apple the opportunity to solidify its position in the mobile market. Perhaps the most anticipated change in the iPhone 3.0 update is the ability to cut, copy, and paste text—a feature iPhone users have clamored for since the 2007 debut of the iPhone. 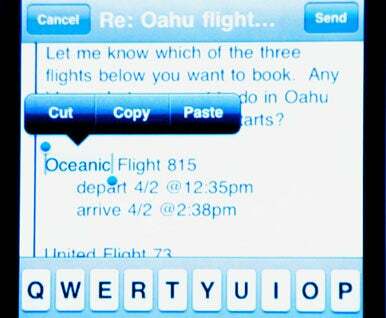 Users will be able to select text with a double-tap, bringing up a cut, copy, and paste bubble. After adjusting the selected text with a finger drag, users tap on one of the three buttons. Once text is copied, it can be pasted anywhere—even in a different application—with another double-tap to summon the cut, copy, and paste bubble. Users can copy and paste text, HTML, and photos. iPhone 3.0 also brings a horizontally-oriented keyboard to other apps—most notably Mail, Notes, and the renamed Messages texting client. Messages features Multimedia Messaging Support, which will let users send and receive photos, contact information, audio files, and locations—at least for customers of 29 carriers in 76 countries. That does not include the United States, where AT&T, the exclusive service provider for the iPhone, will not be ready to support MMS until later this summer. The Find My Phone feature can locate a lost iPhone via MobileMe. Users log into the online service, which will display where the phone is. From there, users can send a message to the phone, and it will play an alert. Find My Phone also enables data to be wiped remotely. Other additions in iPhone 3.0 include turn-by-turn GPS-based directions, a new Voice Memos app, support for the CalDAV format, new search capabilities including a new Spotlight app, and expanded parental controls. The iPhone 3.0 update also adds support for tethering, allowing users to turn the phone into a modem for laptops and other mobile devices. Again, AT&T is not among the carriers that will support tethering at launch. Which iPhone 3.0 addition or enhancement is the most significant? While Interpret’s Gartenberg likes the addition of a landscape keyboard to more apps—“I think having a landscape keyboard is going to help make the device a lot more useable,” he says—users will likely embrace the features that improve the experiences most important to them. “Your favorite feature will be determined by how you use the device,” Gartenberg added. Users aren’t the only people reaping the benefits of the iPhone 3.0 update. The new software also features 1,000 programming tools aimed at helping developers add to the scores of apps available through Apple’s online App Store. The updated software allows for push notifications where apps for instant messaging, news alerts, calendaring, and social networking can be closed but still provide notifications when changes occur. Developers can now offer apps using a subscription model, and they’ll be able to sell products from within the app itself. The iPhone 3.0 update also gives developers access to new capabilities. App makers can now embed a map directly in their programs with support for regular, satellite, and hybrid views. Bluetooth features have been expanded so that peer-to-peer connections between phones can be enabled via the wireless protocol. The 3.0 update will also feature support for accessories that attach to the iPhone’s dock connector. New developer tools mean better apps, and so far, Intercept’s Gartenberg notes, the 50,000 or so offerings in the App Store have helped distinguish the iPhone from rival smartphones. Many smartphones can offer features like Exchange support, Gartenberg, added, but only Apple can point to a massive App Store offering plenty of third-party add-ons. Giving the developers of those add-ons even more to work with sets the stage for more App Store growth. “If third-party developers can deliver on what Apple has been working on [with iPhone 3.0[, that will set the platform apart even further,” Gartenberg said.